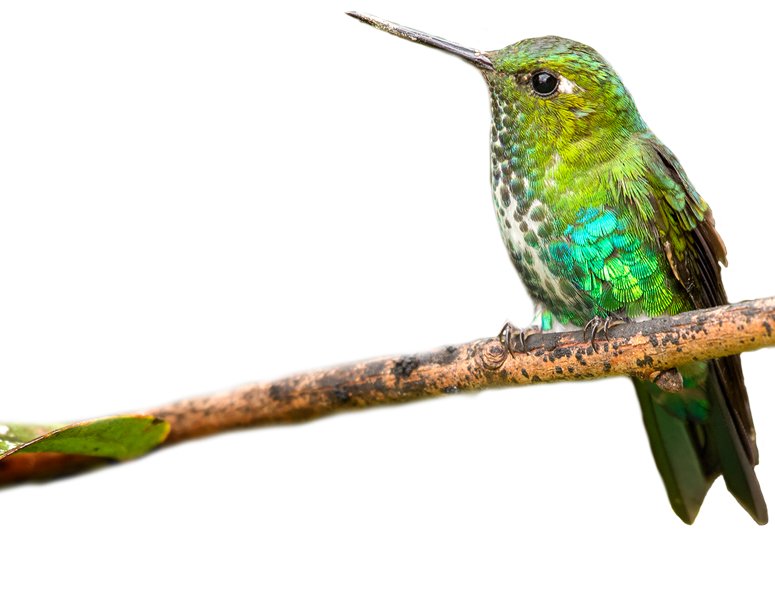 Difficulty: The majority of birding is done in close proximity to the vehicle with some short walks on relatively flat terrain. 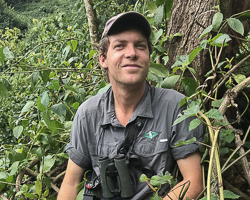 The Tagdilt Track may involve some longer walks when searching for species, and Oukaïmeden may involve a little more uneven/rocky terrain to find the specialties. Climate: Generally warm and sunny in the middle of the day, although quite cold in the early morning and evening. Rain is also a possibility. The high Atlas and the Anti-Atlas can be quite cold, especially early in the mornings, and during the evenings. 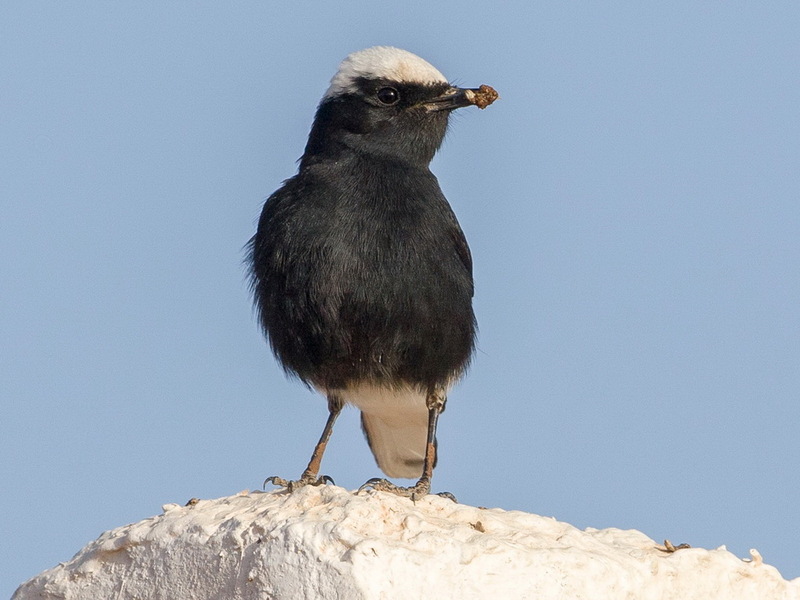 Birding in Morocco is both scenic and exciting, and the country has many first-class birds, including a number of near-endemics, such as the stunning Moussier’s Redstart, Tristram’s Warbler, Levaillant’s Woodpecker, and the odd-looking Northern Bald Ibis. 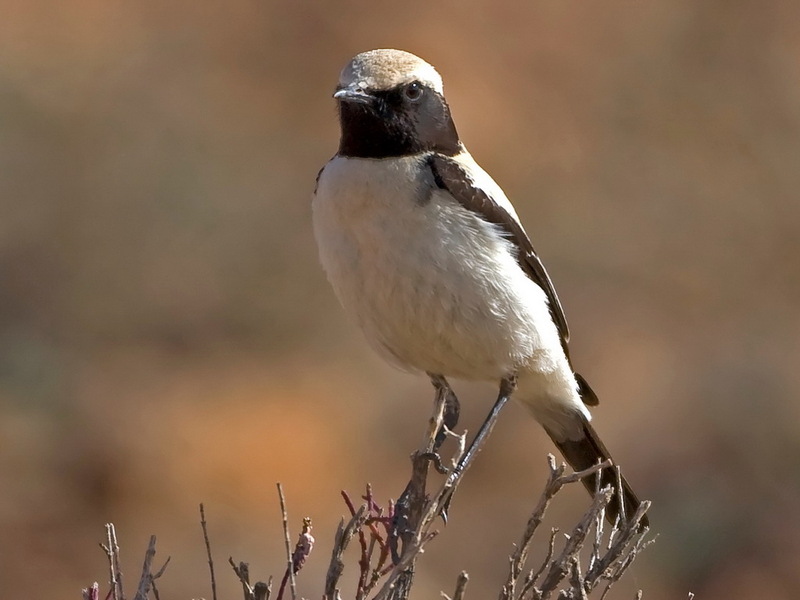 This tour follows the birdlife of the Sahara desert and the Atlas Mountains, as well as incorporating the spectacle of the spring migration from Africa to Europe. 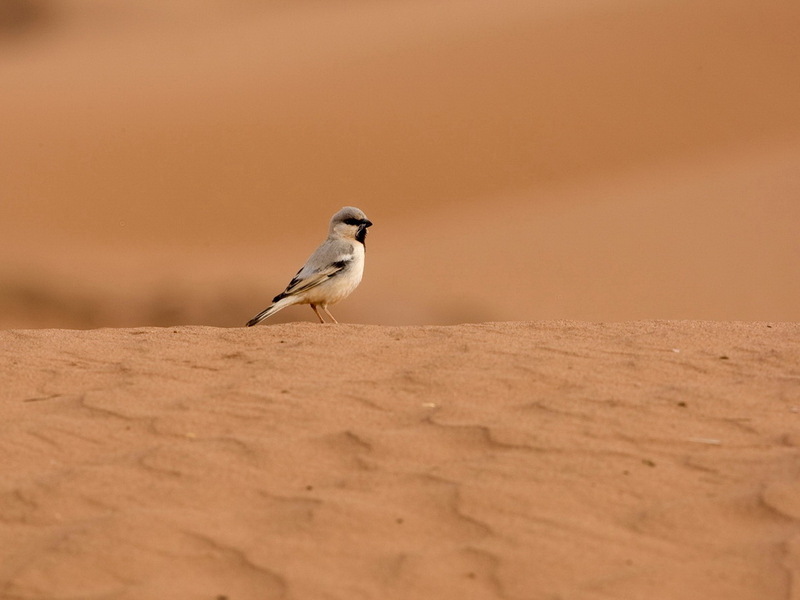 From the snow-capped Atlas Mountains at around 2600m to the low-lying beautiful dunes of the Sahara desert – the birds we see are always against an impressive backdrop wherever we are! 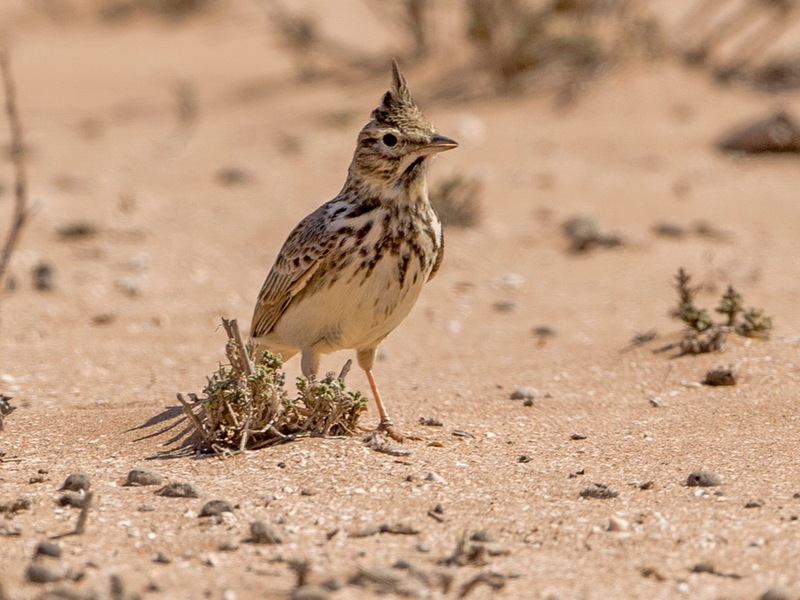 In early spring birds are migrating to Europe, and the beautiful Moroccan landscape explodes into bloom, helping the numerous passerines on their northward migration. 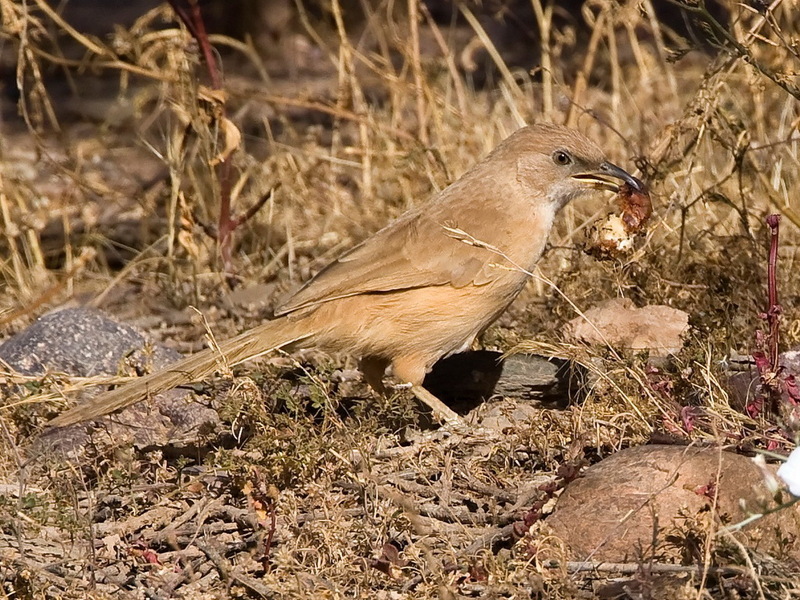 However, for many it is the numerous mouth-watering near-endemic and desert specialties that can be found in Morocco which are the biggest draw, and the list is long! 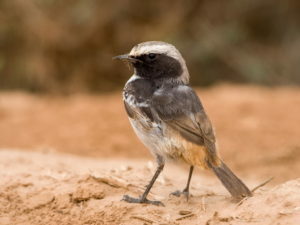 Whether it be seeing a beautiful male Moussier’s Redstart perched on roadside bushes, waiting at dusk for a view of the mystical Egyptian Nightjar or Pharaoh Eagle-Owl, searching for small groups of Cream-colored Courser and Thick-billed Lark on the now famous Tagdilt Track, sifting through migrants in a desert hotel garden, watching African Desert Warbler in the sand dunes, or simply enjoying the desert scenery among camels, there is something for everyone on a Morocco birding adventure! 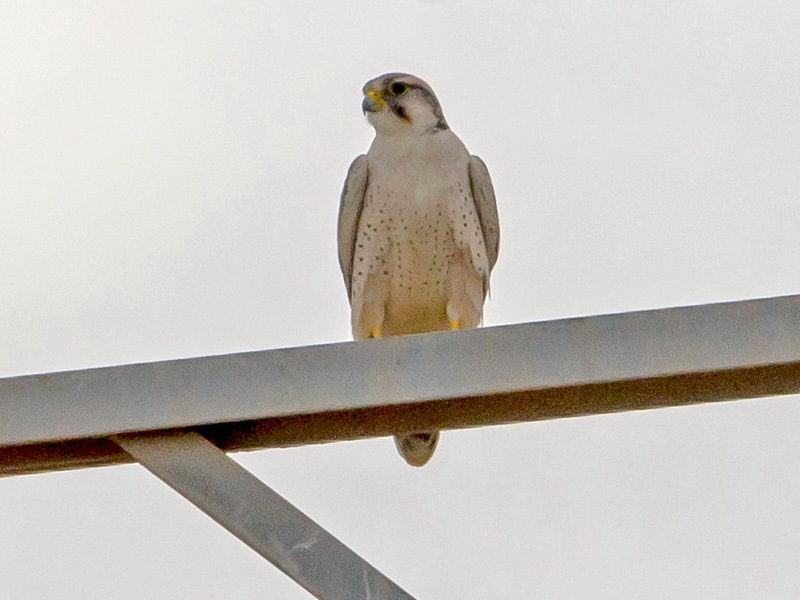 After meeting at Marrakech airport, if there is still daylight, we can begin birding straight away; there are many common species within walking distance of the terminal building! 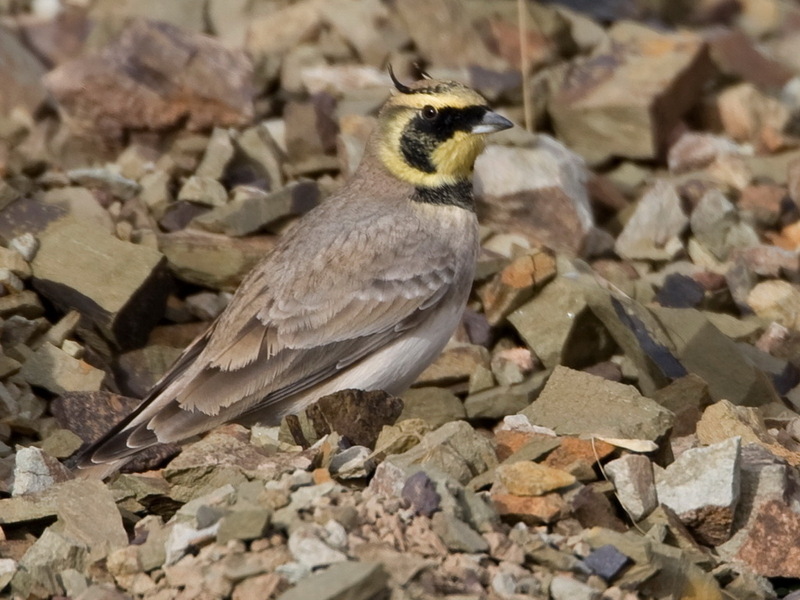 Striolated Bunting, Common Bulbul, and both Pallid and Little Swifts are all possible, and migrants can also be found in the nearby gardens. Time permitting, we will drive to the foothills of the Atlas Mountains, where we may encounter species such as Bonelli´s Eagle or Levaillant’s Woodpecker. Should you plan on arriving the previous day in order to settle in adequately, we can arrange a slightly longer drive up into the high Atlas Mountains, just south of the city, and visit the ski resort of Oukaïmeden (2600m). Here we will search for various species, ranging from Moussier’s Redstart, Barbary Partridge, Blue Rock Thrush, and the regionally endemic Levaillant’s Woodpecker to other such desirable species as the handsome African Crimson-winged Finch, Horned Lark, Rock Sparrow, Water Pipit, and Red-billed and Alpine Choughs. 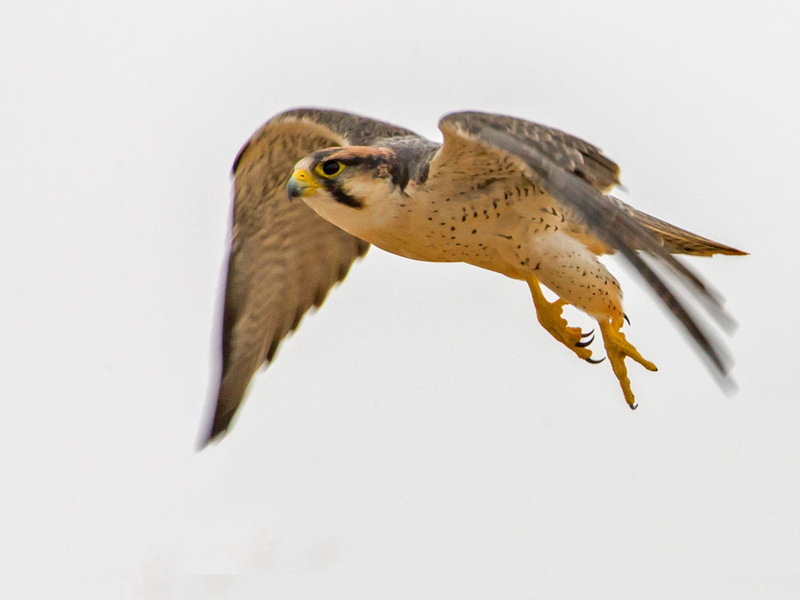 Raptors to keep an eye out for include Golden Eagle and possibly the majestic Bearded Vulture. 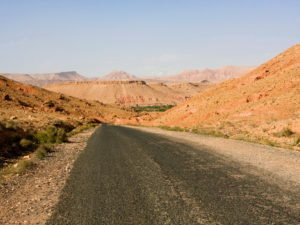 We will drive through the high Atlas Mountains en route to Ouarzazate. We will make a few stops in good habitats, and we’ll also keep our eyes open for raptors, of which this area has many – Lanner Falcon, Barbary Falcon, Lesser Kestrel, Black Kite, Long-legged Buzzard, Short-toed Snake Eagle, and Booted Eagle all being possible. Before long we will find ourselves entering the Tizi n’Tichka pass. This is an impressive place, and we will admire its fabulous geological rock formations before continuing on our journey to the plains below. The road continues down the other side and continually winds back and forth, and we will take a few short breaks at various points, as always searching for new species. 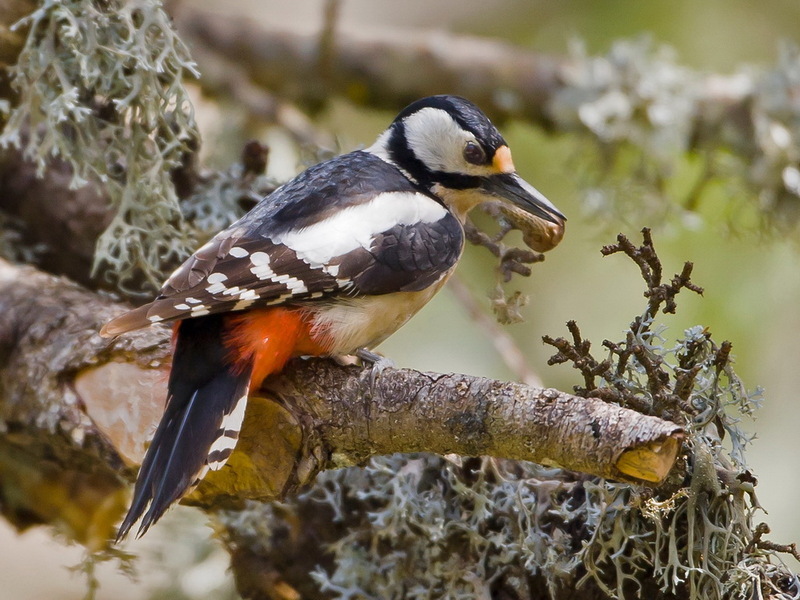 Key birds that we will be keeping a close eye out for will be Levaillant´s Woodpecker, Mourning Wheatear, and Trumpeter Finch. After exiting the mountains we enter into the ‘gateway to the Sahara’ and arrive in Ouarzazate. Should we have time available in the afternoon, there are many sites around Ouarzazate to explore, including a large reservoir with surrounding vegetation. Here we can expect various wildfowl (such as Marbled Duck and Ruddy Shelduck), along with various migrants, including many Warblers (Western Bonelli’s, Western Orphean, and Western Olivaceous). Today we travel deep into the southern parts of Morocco to the village of M’Hamid, located on the edge of the Sahara. Leaving Ouarzazate we follow the Draa River past Agdz, until we eventually arrive at M’Hamid. 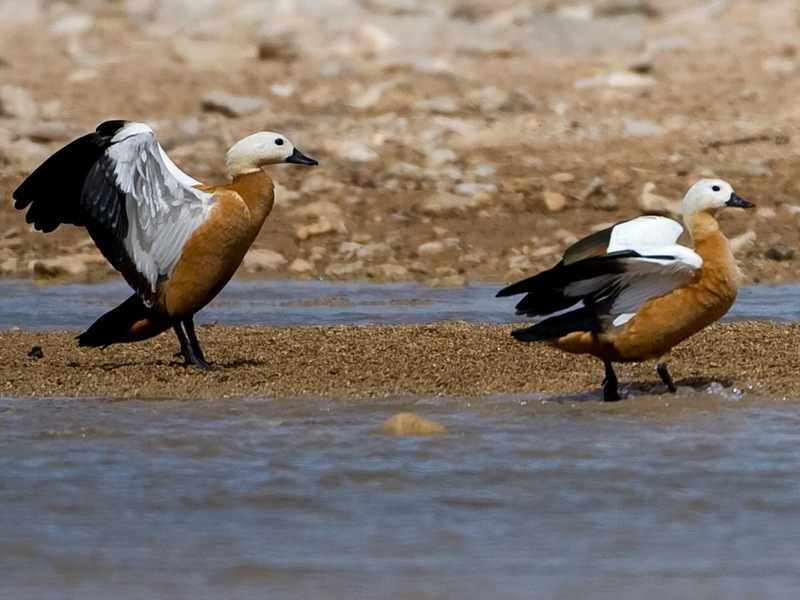 We will have numerous birding stops en route, where we explore various sections of the Draa River, along with the accompanying ‘wadis’. The birding along the way can prove fruitful, as the river draws a lot of life from the seemingly dry and barren landscape surrounding it. Bird species we’ll target include Western Yellow Wagtail, Red-throated Pipit, White-crowned Wheatear, Laughing Dove, and Blue-cheeked Bee-eater, together with many other migrants. 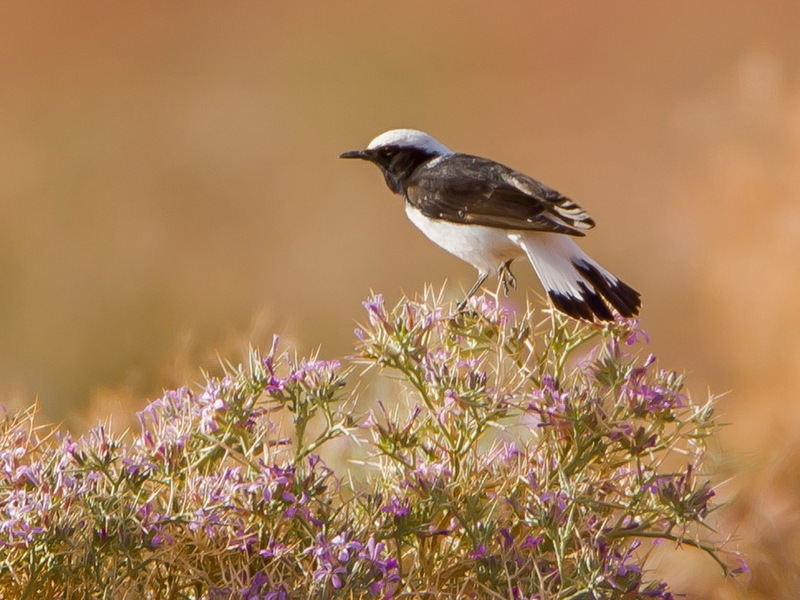 We will also take some time to explore the area around M’Hamid for specials such as the highly-prized African Desert Warbler, cryptic Desert Lark, and the enigmatic Trumpeter Finch. 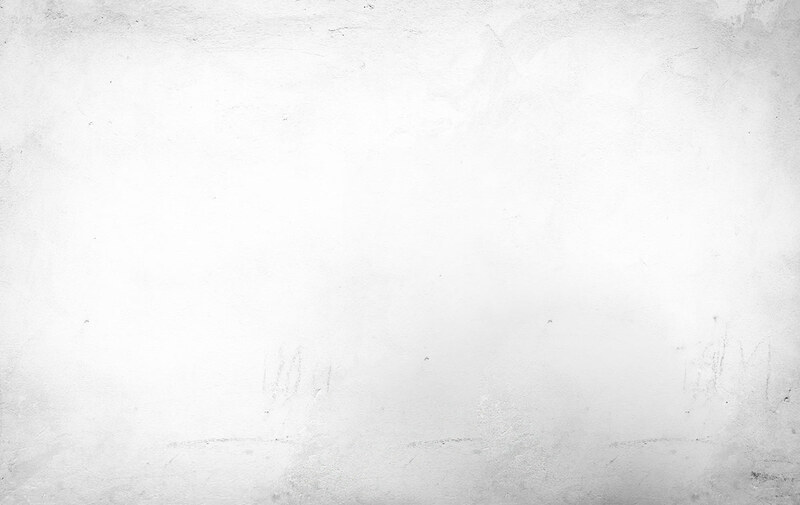 Today we embark on a journey into the Sahara, using M’Hamid as our base. We will make use of 4×4 vehicles and set off into the desert. 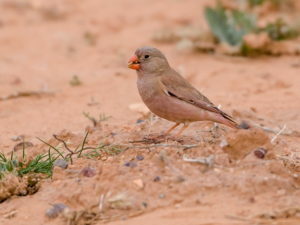 It is quite remarkable, when entering the desert, to see how the composition of it varies and changes, and we will be visiting these differing areas in the desert, along with a ‘must-see’ oasis, in order to maximize the birds seen. This area is always particularly exciting, and it holds some true gems in store for us. 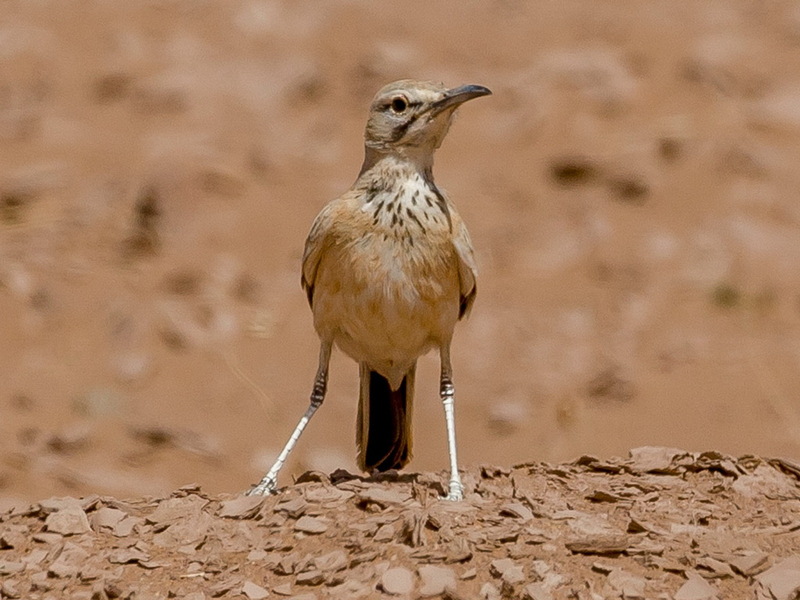 Bird such as the strange, yet striking Greater Hoopoe-Lark, together with Crowned, Spotted, and Pin-tailed Sandgrouse and Cream-colored Courser feature high on the target list. We also stand a chance of running into African Desert Warbler,Brown-necked Raven, various other Larks such as Bar-tailed, Greater Short-toed, Desert, and Crested, along with Desert Wheatear. Large flocks of Trumpeter Finchesmove through the area, and we should hopefully bump into a few of these subtly beautiful birds. We will return to M’Hamid in the afternoon. 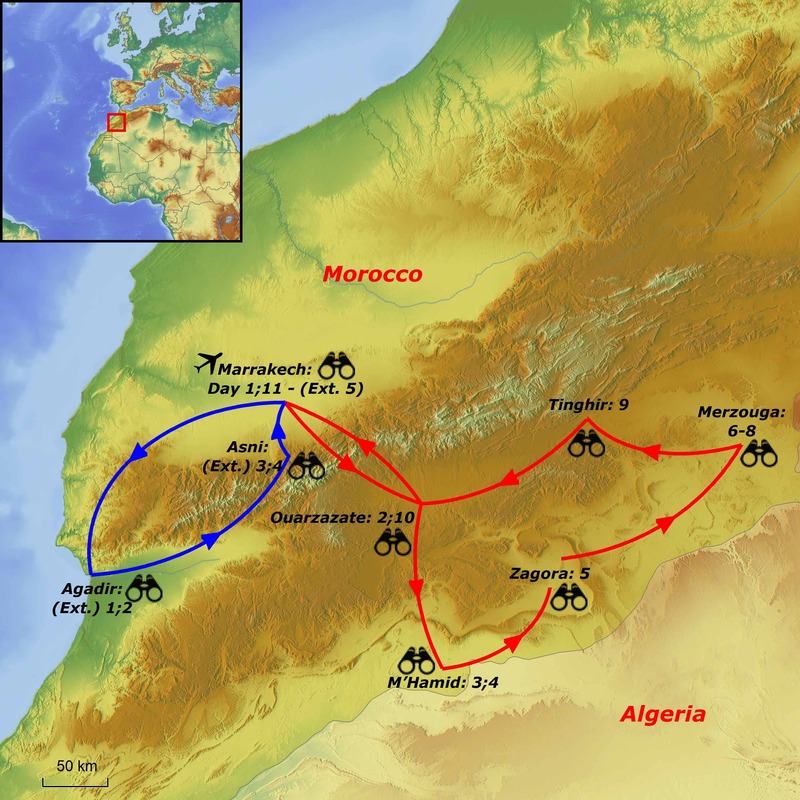 Today we transfer back north to Zagora, a short hop away. We will start off by exploring the Draa River close to M’Hamid for a variety of migrants along with any other species we may have missed, such as African Desert Warbler, Desert Wheatear, and Desert Lark. We will be taking many stops on the journey to explore the surrounding vegetation, which for the most part is largely dry; however, bordering on the river greenery is regularly evident.  There is a good chance finding Blue-cheeked Bee-eater en route. 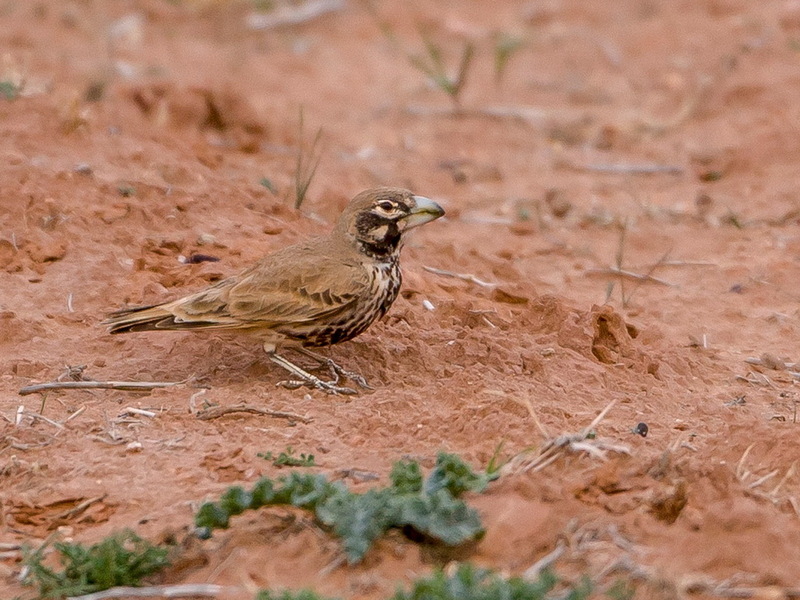 Barbary Partridge and Striolated Bunting are usually evident around Zagora. 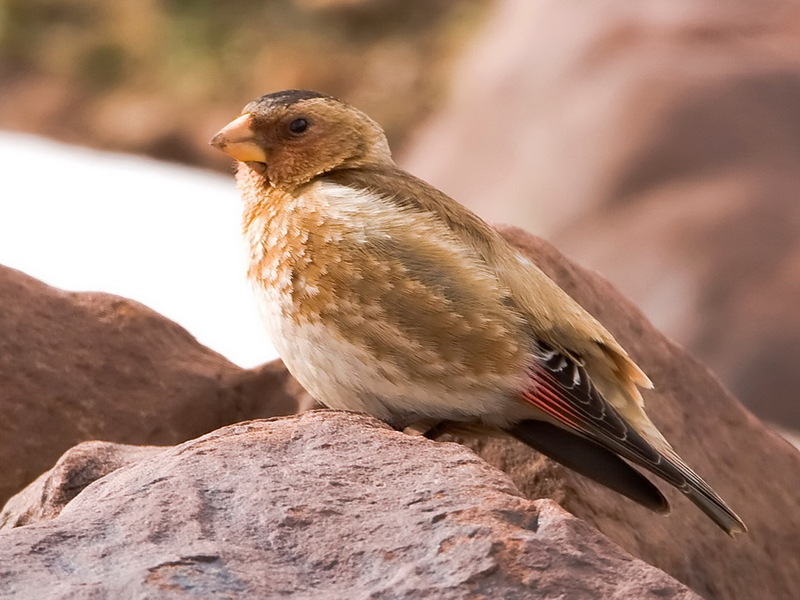 In addition to the birds one of the other attractions of the area is the opportunity to experience the Berber culture, and it is a stunning experience to see how they view life and how they go through it. With a fairly long drive ahead of us, we set off relatively early from Zagora, where we’ll be traveling to the edge of the Sahara at Merzouga. Situated right on the edge of the Sahara desert, we will stay here for the next three nights, giving us ample time to explore the area fully. The drive east will no doubt be a start-stop journey, as we check out the numerous wadis and palm-fringed oases. This is exciting birding, and the possibilities are endless, as these areas can often be full of migrants refueling before continuing their journey north into Europe. 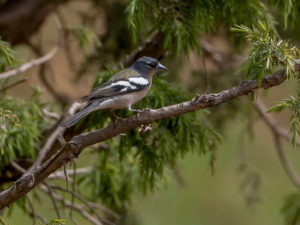 We’ll be specifically looking for gems such as the superb Subalpine Warbler and European Bee-eater, among many others. 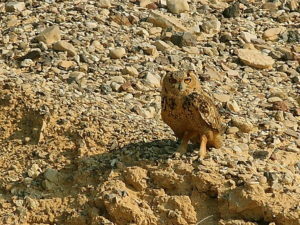 A short walk before arriving at Merzouga will give us the chance to see the magnificent Pharaoh Eagle-Owl. 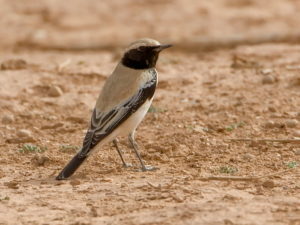 Dependent on the recent weather and the abundance of migrants, just a short stroll from our lodging on the edge of the Sahara can produce exciting migrants such as Eurasian Hoopoe, Woodchat Shrike, Eurasian Wryneck, Rufous-tailed Scrub Robin, Bluethroat, Western Orphean Warbler, and European Bee-eater, to name just a few. 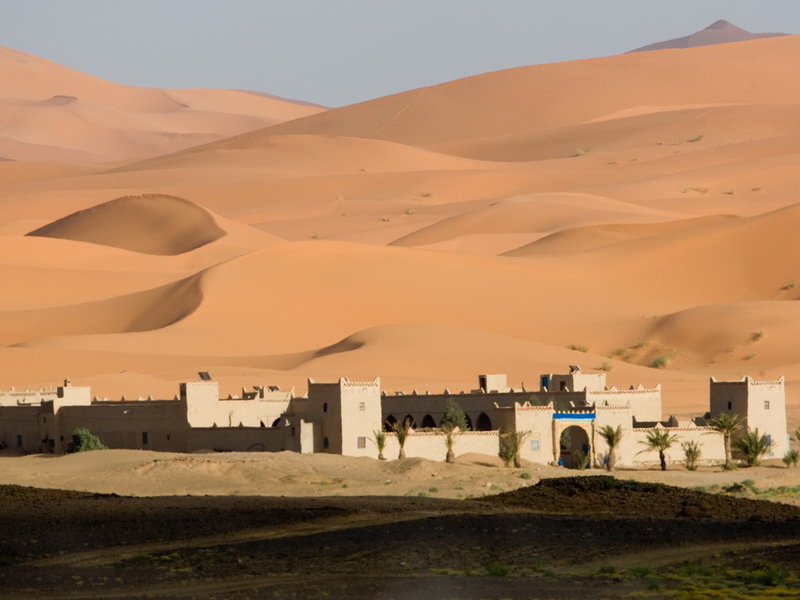 We will spend the next two days checking various sites around the edge of the red sand dunes of the Erg Chebbi – the largest dune system in Morocco. 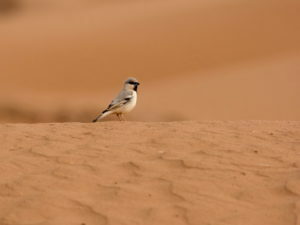 Aside from their awe-inspiring nature, the dunes and surrounding areas play host to some truly great and desirable birds. 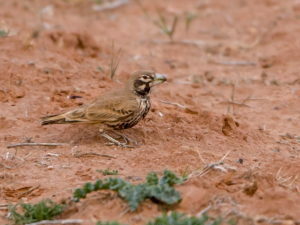 Our major prize should be found around the various cafés that are dotted about the landscape, and in one of these remote outposts we hope to find the elusive, yet beautiful Desert Sparrow. 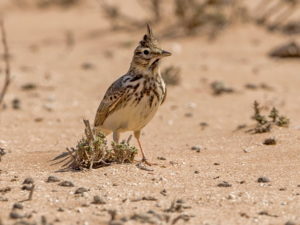 Other species we will search for include Fulvous Babbler, Greater Hoopoe-Lark, Tristram’s Warbler, and with much luck the highly sought-after Houbara Bustard. 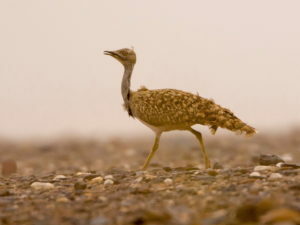 Sadly, the bustard’s numbers have greatly declined in Morocco due to hunting from falconers, and most birds in Morocco are now from a reintroduced breeding program, intended in part as query substitutions for wild birds. Other species in this area include Bar-tailed, Desert and Greater Short-toed Larks, Desert and Black-eared Wheatears, African Desert and Spectacled Warblers, Trumpeter Finch, Southern Grey Shrike, along with Spotted and Crowned Sandgrouse. 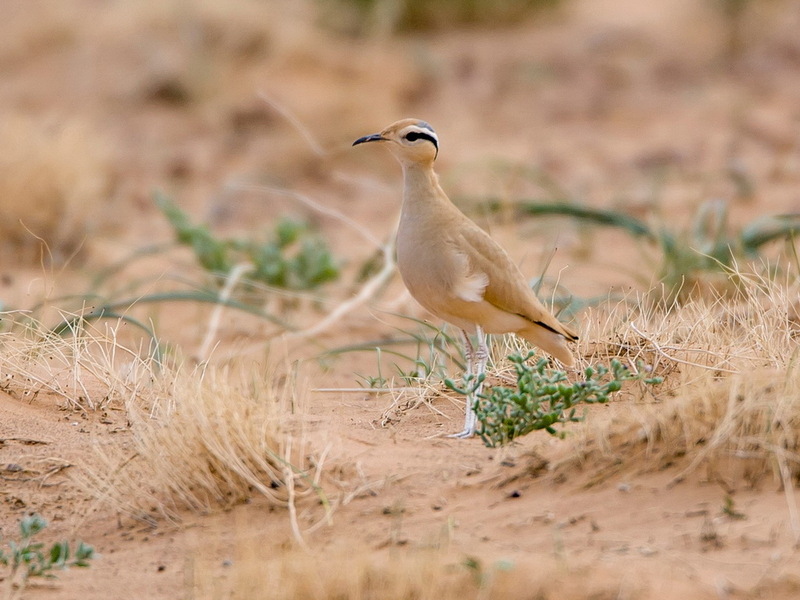 We will focus on the desert species in particular, taking advantage of our 4×4 vehicles to find the harder species, such as sandgrouse and bustard. We will also spend some time at dawn or dusk searching for the rather unpredictable Egyptian Nightjar, which sometimes breeds in the nearby wadis. There is even a chance of them coming into the lodge grounds to hawk insects in the evening! Seasonal lakes are occasionally present in the area, and when they are they attract numerous wildfowl and waders, such as Marbled Duck, the attractive Ferruginous Duck, Greater Flamingo, the bizarre sight of a Western Marsh Harrier out in the desert, and large numbers of shorebirds, ranging from Black-tailed Godwit to Common Greenshank and Dunlin. 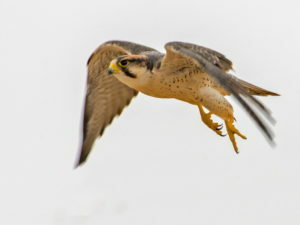 It is also worth scanning the skies for visible migrants, and as the day warms up it is possible to see good numbers of storks and raptors rising on the thermals and heading north towards their breeding grounds. Today we depart the Sahara and head for the foothills of the Anti-Atlas Mountains. Our first site on the agenda is the area around Erfoud. Here the main objective is to explore the wadis of the area, with the main target being Fulvous Babbler. 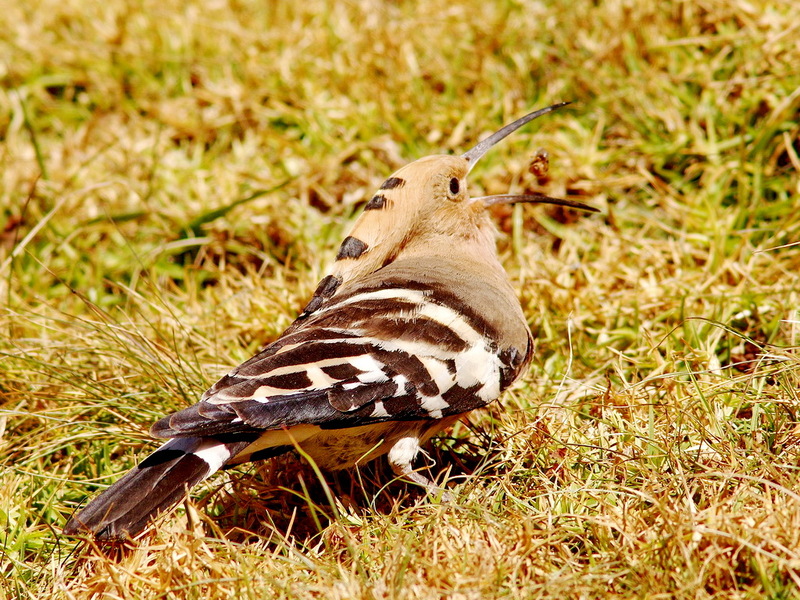 This is a notoriously tricky bird and can regularly prove difficult to find. Todra Gorge follows this shortly after. Here the deeply carved cliffs play host to Bonelli’s Eagle, Little Owl, Blue Rock Thrush, and Eurasian Crag Martin. However, Dartford Warbler must surely be one of the top specials of this area. We will spend a bit of time exploring here. The afternoon stint, however, belongs to the famous Tagdilt Track. Despite the presence of a nearby rubbish-tipping site, the dry, stony, barren plains of the area play host to a large number of tricky desert specials. 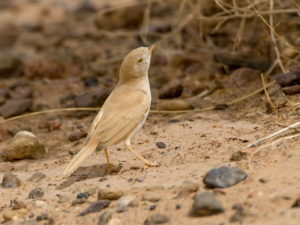 These include Cream-colored Courser, Black-bellied and Crowned Sandgrouse, Thick-billed, Temminck’s, Bar-tailed, and Desert Larks, and Trumpeter Finch. 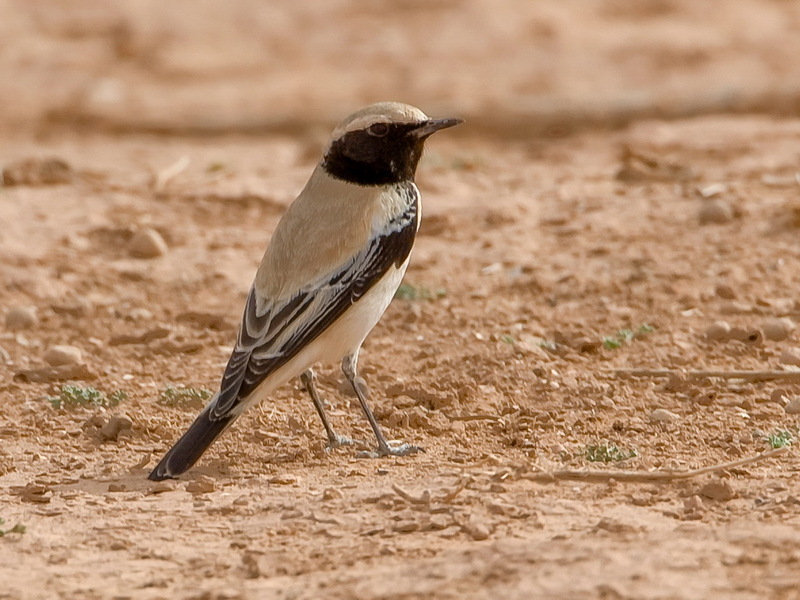 A nearby building hosts breeding Mourning, Desert, Red-rumped, and White-crowned Wheatears. We slowly drive along the track, hopping out regularly to scan the plains for the various specials, as well as undertake short forays out into the plains to find the species. The birding along here is usually very productive! We will start the morning off along the Tagdilt Track, where we will try to track down any of the desert species we are still missing from the area. 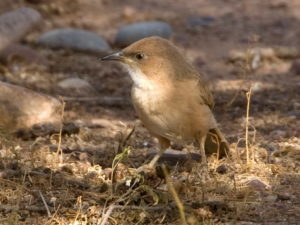 A nearby riverbed also plays host to some good birds, and a stroll through it provides us with good chances of Eurasian Hoopoe, European Bee-eater, Western Orphean Warbler, along with Tristram’s Warbler and the often tricky Streaked Scrub Warbler in suitable habitat nearby. 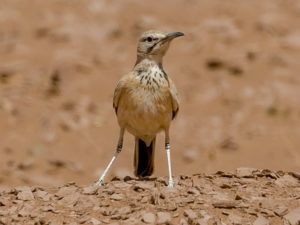 We will then transfer to Ouarzazate, with stops along the way for various desert larks, wheatears, sandgrouse and coursers, along with Barbary and Lanner Falcons. 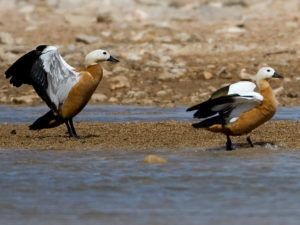 We will visit a reservoir just outside Ouarzazate, where we will spend the afternoon birding for waterfowl such as Ruddy Shelduck, Northern Pintail, and Marbled Duck, and various others including a plethora of warblers, ranging from Western Bonelli´s to Western Orphean, Subalpine, and Western Olivaceous Warblers, and a few wheatears such asDesert, Northern, and Black-eared Wheatears. 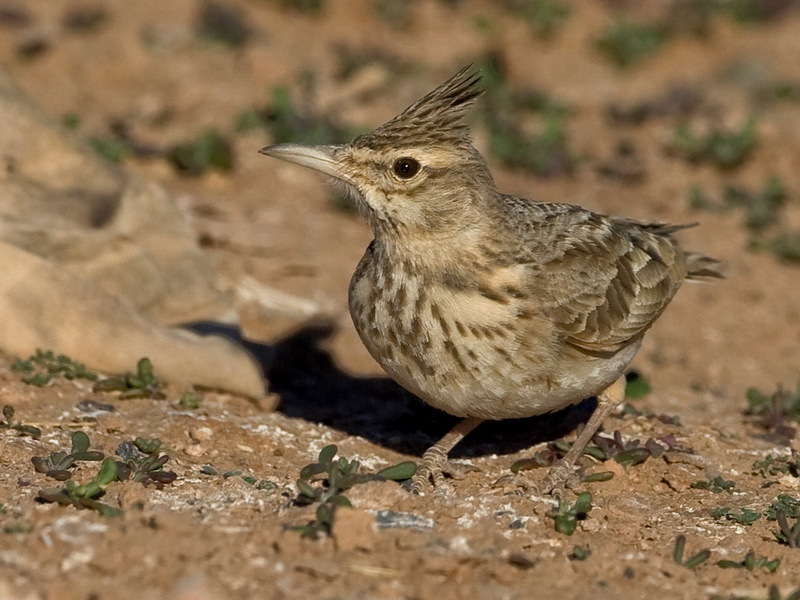 There is also a good chance of various other migrants in the surrounding scrub, most notably Eurasian Wryneck and Bluethroat. Today will largely be at leisure, as we make our way towards the airport for our afternoon departures from Marrakech. We will be passing through the high Atlas Mountains en route, and so will still be able to try for various species that we may have missed earlier in the trip, namely Levaillant’s Woodpecker, Short-toed Treecreeper, and Common Firecrest, along with hopefully some of the many raptors this mountain range plays host to. We also have the opportunity to take in many aspects of the traditional culture, with visits to various ruins and historical sites on offer while we travel back. 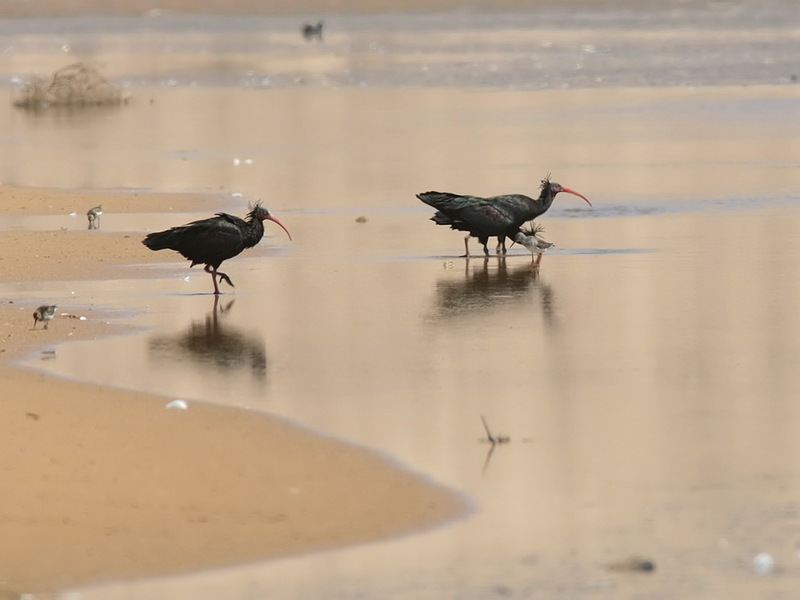 We will arrive in Marrakech for our afternoon departures back home, or one can join the extension below, where we visit the coast and try for Northern Bald Ibis, among others. At the end of the main tour above, we have an afternoon transfer to Oued Massa Nature Reserve, south of Agadir, for the start of the extension. This is quite a long drive of between three to four hours; however, it is on a new highway. We expect to arrive between 7:00 p.m. and 8:00 p.m. This is a travel day, and there will not be any major birding en route. 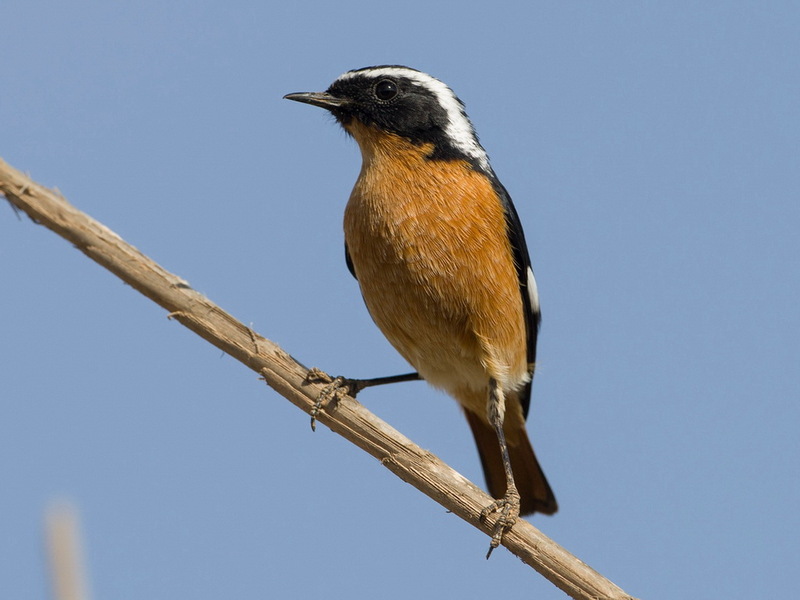 Today we have a full day birding around Oued Massa Nature Reserve and may also venture into the surrounding Sous-Massa National Park as well. The primary target of this area is the unique Northern Bald Ibis, which is a very localized, threatened species and has only a few breeding colonies in the world. 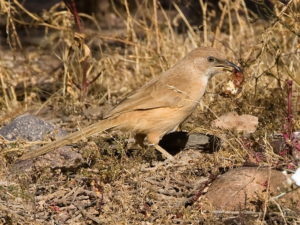 We will spend our time searching for this bird and will spend some time with them once found. This area is littered with rich and productive estuaries, rivers, and water bodies. It is in these that we will search for waterfowl, including Northern Pintail, Marbled Duck and Ruddy Shelduck, Herons ranging from the small Squacco to the large Purple, many gulls and terns, including Audouin’s and Mediterranean Gulls and Caspian Tern,Glossy Ibis, Western Marsh Harrier, and Brown-throated Martin. 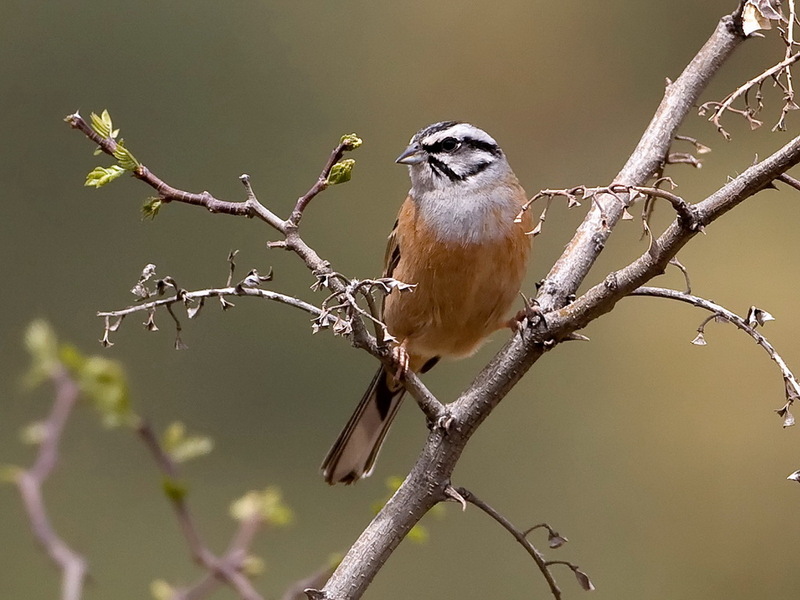 Black-crowned Tchagra is another specialty of the area, and its rich, liquid calls ring out from the dense scrub. Among others, we will also try for Spotless Starling, Great Spotted Cuckoo, Zitting Cisticola, Red-rumped Swallow, Pallid Swift, and a variety of Warblers includingSavi’s, Western Olivaceous, and Moustached. 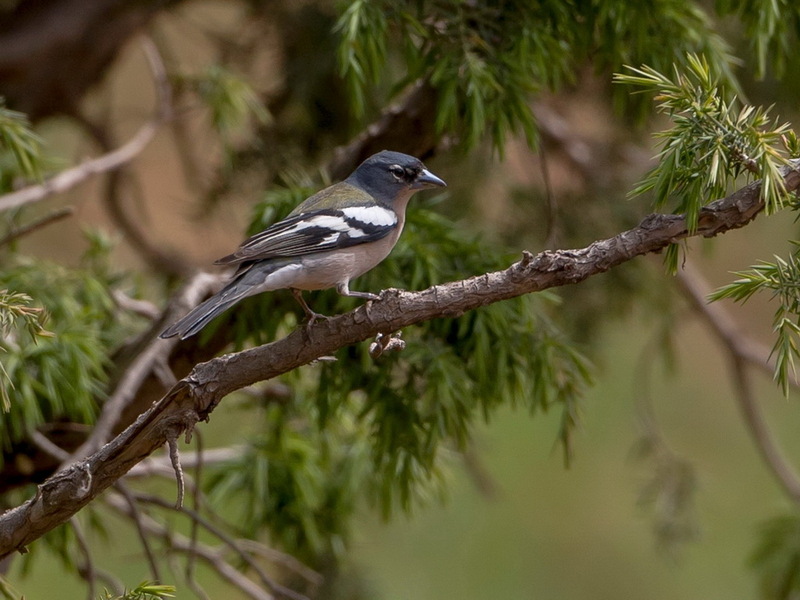 We have the morning available to bird around Oued Massa Nature Reserve and try for any of the main species we may have missed yesterday. We can also search some of the surrounding great wetlands for further species such as Baillon’s and Little Crakes and many other wetland species. After lunch we will depart into the Atlas Mountains near Marrakech. This is a scenic transfer through the mountains, and we will have many stops en route. 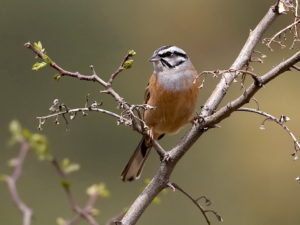 We will likely only be able to bird in the foothills of the Atlas Mountains, where we can expect species such as Moussier’s Redstart, Levaillant’s Woodpecker, and Black-winged Kite, among others. Today we have a full day available to bird in the high Atlas Mountains, in the vicinity of the ski resort of Oukaïmeden. Here we will search for Barbary Partridge, Blue Rock Thrush, and the north African endemic Levaillant’s Woodpecker, along with Hawfinch, Goldcrest, and Common Firecrest. 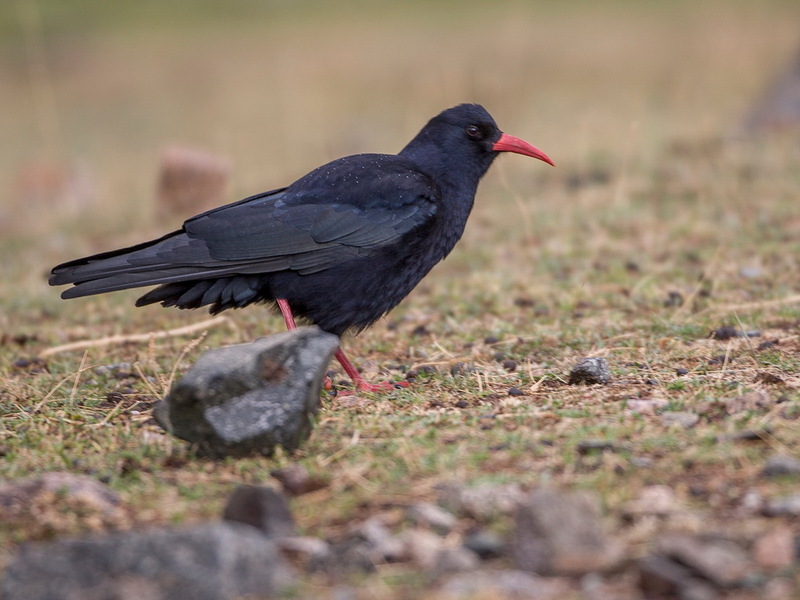 At the higher elevations and amidst the snow-capped peaks we will search for African Crimson-winged Finch, Horned Lark, Rock Sparrow, Rock Bunting, Alpine and Red-billed Choughs, Water Pipit, White-throated Dipper, Alpine Accentor, and Ring Ouzel. Golden Eagle is a possibility, and Bearded Vulture occurs rarely in the area. The scenery is absolutely spectacular here and serves well to compliment the birding. This is usually a very exciting day, and it holds many fabulous birds for us. 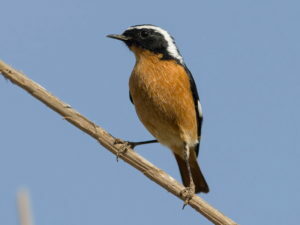 We have the morning available for birding, should we have missed any of the Atlas species, and we can bird around the foothills and lower slopes of the Atlas Mountains for species such as Levaillant’s Woodpecker, Moussier’s Redstart, Barbary Partridge, Short-toed Treecreeper, Hawfinch and Common Firecrest. After lunch we will head for the airport for our departures.